Few things can make someone smile the way your favorite pets can, especially when they’re all dressed up. However, finding the perfect Halloween costume can be tricky (and a little pricey). 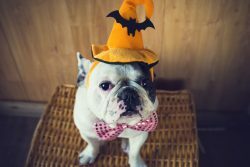 Get creative this season and try one of these easy-to-make DIY pet costumes! Is your pet a purrincess or a bullarina? A fluffy tutu may be just what you need to help your pet express themselves this holiday. 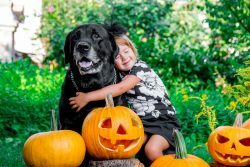 With just a quick trip to the craft store, you can get started creating a homemade costume that will be the bark of the ball. You’ll need a strip of elastic, Velcro for both ends, and a spool of tulle. Measure around your pet’s waist to determine the length of the elastic (be sure to cut an inch or two smaller so it can stretch). Then, secure the Velcro to the ends of your elastic strip for easy wear. Finally, start tying on small strips of tulle, cut to your desired length of skirt. The more pieces of tulle you use, the fluffier the tutu! Tip: It helps to keep the underside of the skirt bare so that the tutu does not get soiled during potty time. Sometimes pets can save us as much as we can save them. Let your dog or cat become the superhero they’ve always been to you. To create their outfit, simply cut or purchase a large enough piece of material that you can tie around your pet’s neck. Make sure it’s not too tight so that your pet can breathe, and then drape the extra material over the back. You can choose whichever superhero your pet most embodies, or create a brand new superhero just for them. Try making a logo or pattern on your cape by using felt or fabric paint. You can even use a sewing machine. The possibilities are endless! If your pet prefers low-maintenance attire, try turning them into a cuddly teddy bear. Your favorite stuffed animal probably has (or had) a tag on them from when you first purchased it. Re-create that tag on a durable piece of paper or cardboard, and simply attach it to the side of your pet’s collar. Voila! It’s like you just picked out a new “stuffed” animal all over again. This one is perfect for last-minute attendance to Halloween parties or parades, since it only takes a few minutes to make. The most important rule of dressing up is to have fun. Make sure your pet feels comfortable and keep an eye on them while they’re sporting their new clothes. Have a happy Halloween! Good quality sleep is important for your health, and your pet can help!